Holy moly! 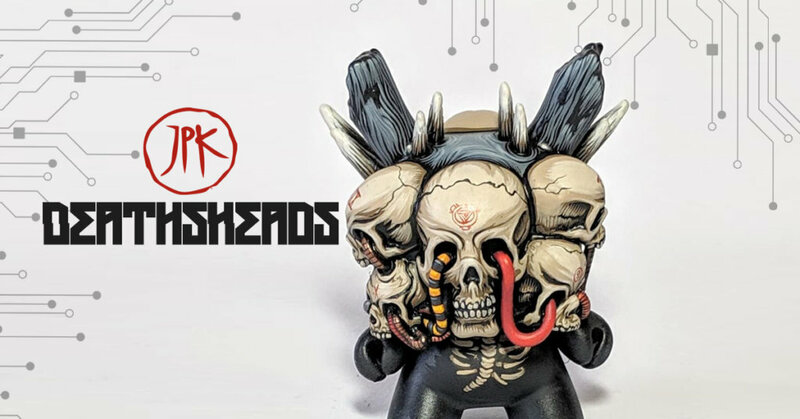 We can’t even begin to comprehend the latest custom Kidrobot Dunny by Jon-Paul Kaiser. We have been looking at the below image for about an hour now and with each look we fall further heavily in love. Our eyes feel deceived as we know this is a 3D Dunny platform, but those skulls look like they’re on a flat canvas painted as if they are 3D. Which is incredible. Absolutely. This custom is on the Death Dunny by Tokyo Jesus, which formed part of the Arcane Divination Dunny Series. Available from Jon’s booth at DCon #2029 from next Friday 16th November. We can’t wait to see what else JPK brings with him to Anaheim. Jon’s booth is always a joy to behold, and worth checking out and this year it will be even better with Jon being joined in person by J*RYU, Jeremiah Ketner, Tokyo Jesus, Eimi and a possible surprise guest too! Hot mama, that is one helluva booth collective!!! You’ll only be able to check it out if you have a DCon ticket and you know what we say about those DesignerCon tickets, right? They can be purchase directly from the DCon site HERE!